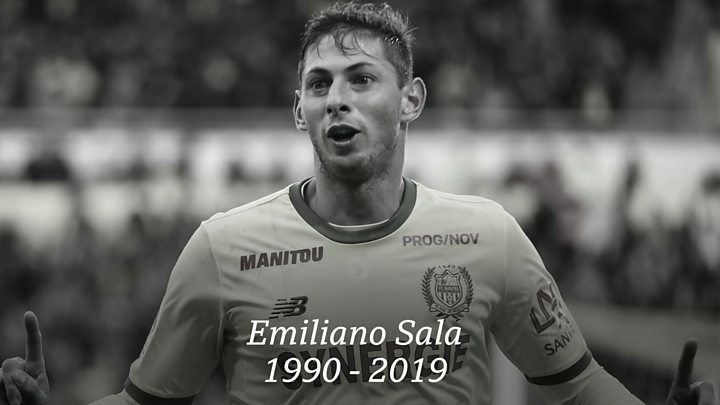 There are calls for a series of flights in the weeks before the fatal crash which killed footballer Emiliano Sala to be investigated by regulators. The aviation trade body Air Charter Association told BBC Wales it believes there are grounds to investigate other flights linked to the £15m transfer. These carried Sala, his agent, Cardiff City officials and others between the UK and France in December and January. Sala's plane crashed in the English Channel on 21 January. The Argentinian striker, 28, had been returning for his first training session after completing his club record move to Cardiff City from Nantes FC. Sala's remains were recovered from the plane wreckage found on the seabed in early February, but pilot David Ibbotson, from Crowle, Lincolnshire, is still missing. The Air Accidents Investigation Branch (AAIB) is currently investigating what happened to the Piper Malibu light aircraft. However Air Charter Association (Baca) says it was concerned other flights involved in the footballer's transfer may not have been properly licensed. What does the interim air accident report say? The fatal flight and others which preceded it were commissioned and paid for by football agent Willie McKay and his family. In an exclusive interview with BBC Wales, Dave Edwards, chief executive officer of the Air Charter Association (Baca), warned the "underground growth" of illegal and so-called "grey" charter flights was putting passengers at risk. These relate to flights which are not properly licensed under regulations governing aircraft and pilots. He said the organisation's concerns about the sector date back about seven years and that they hold regular meetings with both the Civil Aviation Authority (CAA) and the European Union Aviation Safety Agency (Easa) to discuss the issue. Mr Edwards said: "The football agent has said on the record that they paid for a series of flights. "We've done some background research into all of those flights and we're concerned more than ever that all of them have the potential to have, certainly, questions to be asked about them, which is what we've pushed the CAA to be doing recently and also Easa because the origin of the flight was in France so that comes under (their) territory. "There's enough circumstantial evidence here that would make us push the authorities to do a full investigation into the background to ensure it was compliant." Baca has done its own research through the European air traffic control agency and established the various operators and pilots for the flights linked to the Sala deal. BBC Wales has approached all those involved and invited them to respond to the questions raised by Baca. 21 January - the flight leaves Nantes at 19:15 and disappears from radar around an hour into the journey. In its interim report on the Piper Malibu crash, the AAIB stated that Mr Ibbotson did not hold a commercial pilot's licence and could only fly passengers in the EU on a cost-sharing basis, not for reward. The AAIB is continuing to investigate and is expected to report on its findings early next year. It has already released information about the flight path, including radar records from its final moments. BBC Wales understands that all the earlier flights linked to the transfer deal were filed on flight plans as "general aviation" - therefore private, rather than commercial flights - and that none flew under an Air Operator's Certificate (AOC). An AOC is obtained from the CAA - for a cost - and provides a structure for air charter companies, including safety, flight operations, ground operations, compliance and training. Without this, BACA said the series of flights around Sala's transfer could only be operated on a "dry lease" basis - where an aircraft is leased by a customer and a pilot hired separately - or on a cost-share basis. One of the aviation companies involved - Channel Jets, a legitimate air charter company based in Guernsey - does hold an AOC, but only planes registered in Guernsey can be included on this. BBC Wales understands that the two jets used by Channel Jets on seven separate occasions did not fall under the AOC at the time. Both planes used were registered in America, which means they could not be flown commercially in Europe without the express permission of US regulator the Federal Aviation Authority and the CAA. The flights were listed on flight plans, as non-commercial. BBC Wales has discovered that eight days after the plane carrying Sala crashed, one of these planes was de-registered in the US and re-registered as a Guernsey-based plane. It was then placed on the company's AOC. The BBC has approached Channel Jets, who declined to comment beyond saying they had "provided full details to the CAA". Asked whether the Sala tragedy could serve as a "watershed moment" for the aviation industry, Mr Edwards said: "Our industry always had this line that it would take one famous person to be killed in an aircraft accident for it to come to the fore. "It's certainly a moment which has brought the spotlight of attention onto charter flying in general. "We have circumstantial evidence about other flights that take place every day. I do think eventually something has to give." The CAA said: "As there is an on-going AAIB investigation into this accident, it would be inappropriate for us to comment at the moment. We will be assisting that investigation as required." BBC Wales has invited Willie McKay to comment for this story.